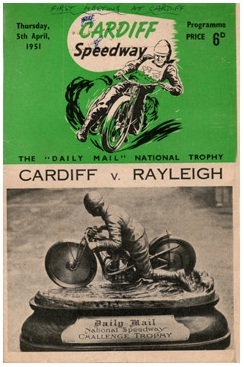 Speedway racing is known to have taken place in at least 4 separate venues around the City of Cardiff, although the first racing took place at the White City Stadium in Grangetown on 1928. That inaugural meeting took place on 26th December 1928 in front of a crowd in excess of 25 thousand. 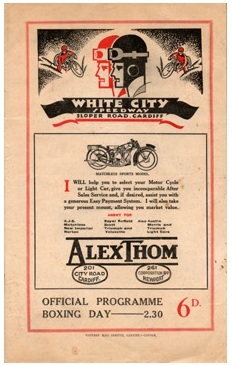 The team enjoyed periods of open racing between 1928 and 1937, and had one year competing in the Provincial League. 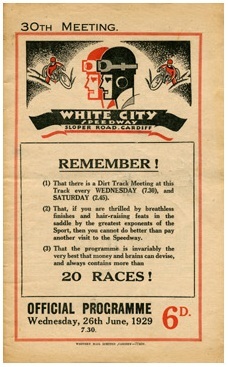 As is customary, speedway followed greyhound racing, and the first recorded greyhound meeting at the White City Stadium in Cardiff was on 7th April 1928. By the early 1950's the team had found a new home at Penarath Road Stadium and held their first meet on 5th April 1951 and were to remain here for just over 2 years, holding their final match on 2nd July 1953. Throughout their history the team has been known as the Dragons.